Do you want your holiday to be a perfect blend of history & culture and enjoyment? 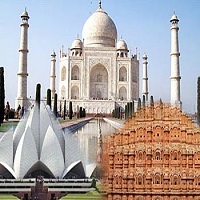 Then you must opt for our Golden Triangle Tour that covers three majestic cities: Delhi, Agra and Jaipur. Through our Golden Triangle Tour, we take you to the history and culture of these three beautiful cities. You will get to see various monuments of historical importance in these cities along with the traditional food, colorful markets and other tourist places. Our tour package includes flight tickets of arrival and departure, airport transfers, hotel accommodation, food and tour guide. We provide you with Golden Triangle Tours at very affordable rates that are packed with fun and adventure.